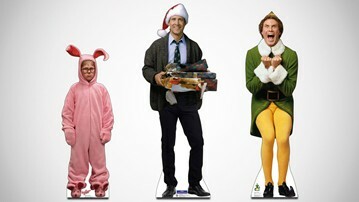 Deck the halls with...life-size cardboard cutouts of characters from your favorite Christmas movies! Plus a few more generic options with empty faces primed and ready for your holiday party photo ops. From A Christmas Story to Elf, and Santa to fill-in-your-face at the 80s Christmas party, here are a few ways to bring big (life-size, in fact!) fun to your holiday decor. What's in those packages making Clark look so happy teetering on the edge of a nervous breakdown? My money's on a one year membership to the Jelly of the Month Club. The National Lampoon's Christmas Vacation Clark Griswold cutout stands...and stares...and smiles sorta maniacally...30" wide x 76" tall. Ralphie Parker from A Christmas Story dons the finest PJs in the land here. From bunny ears on the top of his head to bunny ears at the tops of his feet, this cardboard cutout measures 22" wide x 63" tall x 1 miserable pink nightmare. What's Buddy the Elf excited about. It could be anything. Santa. Presents. Peppermint hot chocolate. Your wife's famous peanut butter blossom cookies. A sack of sh*t. Literally anything. If you want to add Buddy and his enthusiasm to your home this Christmas, clear out a corner with space for a 19" wide x 68" tall cutout. Note: I think they went with excited Buddy in this crouching / gotta pee position because Will Ferrell is truly, like, 75" tall, and that might be a little too much Buddy for even the biggest Elf fans to handle. Yes, it's Santa! That Santa. The one Buddy knows. I don't know what actor played Santy Claus in Elf, but his appearance is pretty much dead-on when it comes to what I envision Santa to look like. Most people who see this cardboard cutout in your house or office probably won't even know it's the Elf Santa. They'll think it's the real Santa. It's not just ugly Christmas sweaters, it's ugly Christmas everything! Baggy jeans, tan turtlenecks, giant permed platinum blonde 80s hair! This cutout is 38" wide x 70" tall, and ready for its closeup - with the face of you and yours filling in the blank at center.